(TibetanReview.net, Oct21, 2015) – While Great Britain greeted Chinese President Xi Jining with pomp and circumstance as he arrived for a four-day state visit on Oct 20, salivating at the prospect of signing more than 30 billion pound business deals, activists turned up in strength to express outrage over government’s human rights silence during the visit. There were clashes, but no violence, between a large orchestrated Chinese crowd on one side and pro-Tibet and human rights activists on the other side. During his pomp-filled four-day state visit, Xi will stay with Queen Elizabeth II at Buckingham Palace, enjoy a state banquet and visit Downing Street, Prime Minister David Cameron’s country residence Chequers and even Manchester City football club, reported AFP Oct 20. But the lavish reception which both sides say heralds a “golden era” in their relations means that China’s deplorable human rights record will not get the attention it deserves. 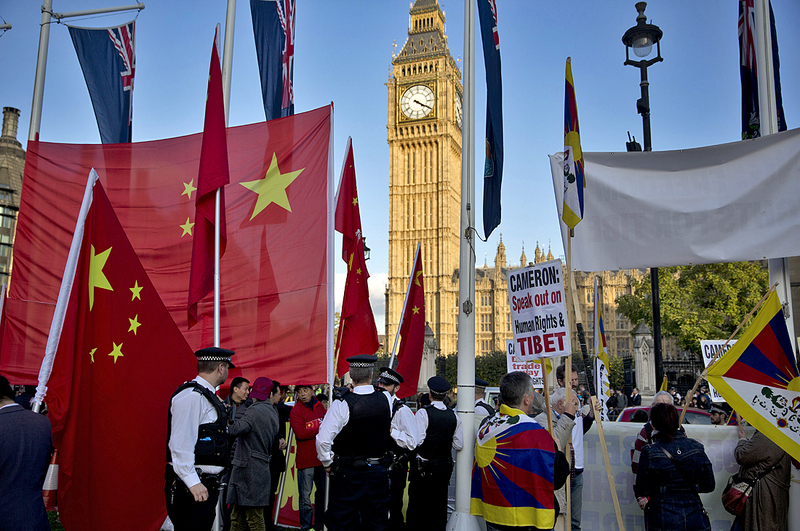 Groups such as Amnesty International and Free Tibet have therefore vowed to hold protests throughout the state visit, starting with one during the carriage procession through central London on Oct 20. At the start of the event, dozens of protesters held a rally, waving the Tibetan national flag and holding placards reading: “End the Crackdown” and “Cameron: Don’t Trade Away Human Rights”. But China came prepared, outnumbering them by thousands of pro-Chinese demonstrators, many of them students from the mainland, sporting hats, T-shirts and flags. And the two entirely mismatched sides were reported to have clashed. Members of the Free Tibet group and those in favour of the Chinese President’s UK visit were seen pushing and shoving, with the opposing demonstrations taking place side by side, reported channel4.com Oct 20. While protesters booed the state carriage procession to Buckingham Palace as it passed, pro-China supporters played the Chinese national anthem through their mobile via a megaphone. And as the procession drew closer, protesters confronted each other, with traditional Chinese drums drowning out the Free Tibet demonstrators. However, apart from lots of pushing and shoving from both sides, requiring the police to intervene, there was no violence, the report added. Prince Charles and wife Camilla officially kicked off the visit when they picked up the president at the Mandarin Oriental Hotel before taking tea. But Charles, heir to the throne and a supporter of Tibet’s exiled spiritual leader the Dalai Lama, did not attend the Oct 20 night’s state banquet.